In the space of five days at the beginning of April, I visited Revolución de Cuba in Reading twice. Once with three other friends on a non-blogging night and the other four nights after that as a sponsored review with my friend Alex. Both nights have their similarities and both also had their quite clear differences. Based in the centre of town on Friar Street, opposite Cosmo and just near Smelly Alley (for those not from Reading yes that’s a real place! 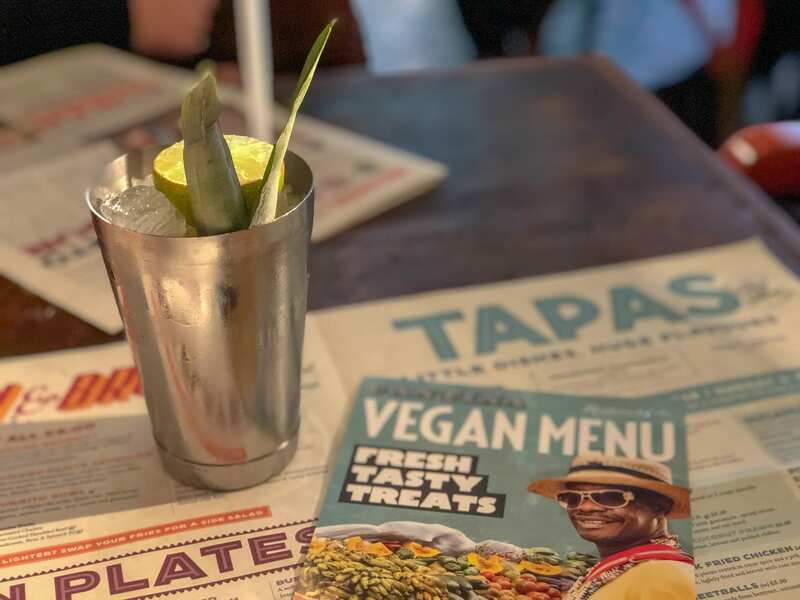 ), Revolución de Cuba, which originally began as a Rum bar in the North of England, is based in a building that is so big they’ve got two bars, including the upstairs Havana rum bar, a VIP lounge and a roof terrace. Latin inspired music, Cuban food, tapas and cocktails pretty much always make for a fun night out. When you need to also visit somewhere that caters for all food preferences, the menus at Revolución de Cuba fit the bill perfectly. For catch-ups with friends, my favourite places to go to are usually cheap, cheerful and delicious. I like good cocktails, friendly staff, fun music and food that’s going to make me go “Ooh! Yum!”. On first impressions, Revolución de Cuba Reading was going to fit all those requirements perfectly. I was, as ever, particularly intrigued by the new vegetarian/vegan menu and have found that since I started blogging about the food scene in Reading (whether independently or sponsored), I’ve become even more aware of the fact that eating out and having more than one vegetarian option is fast becoming easier than it used to be. In the last month or so I’ve discovered so many more vegetarian menu’s where you actually get a menu so big, it’s hard to choose what to have. I’ll be needing to update my Best Vegetarian Food in Reading post sharpish! As you walk through the large double glass doors you’re immediately greeted with bright colours, pretty tiled floors, high ceilings and a big smile! The decor is quirky and bright, the music is just at the right volume and the brightly coloured tables are a good size for lots of plates. I hate small tables when you’re eating tapas as nothing ever fits right and you’re constantly trying to juggle plates around. On my first visit, we had cocktails to start; a classic Strawberry Daiquiri (£8.25), a Mojito (£7.95) and a Pornstar Rumtini (£9.95). They were delicious, very Instagram worthy, and really strong! On my second review visit, I loved the cocktails so much the first time that I was feeling brave enough to order something a little different to usual and chose the Zombie! The menu says that it comes with ‘added fire” and showed some kind of cut fruit with flames on the image. Mine didn’t come with any fire but tasted fine, though not as nice as the other cocktails. The new Cantina menu is huge! With both the normal menu and the vegan menu to choose from I genuinely couldn’t decide what to order on either visit as everything sounded so good. I was a little disappointed that on both occasions the jack-fruit wasn’t available. Does it run out really quick? Do they not order enough? Who knows. With a mixture of Tapas, Quesadillas, Nachos, Chilli, Skewers and salads piled high with various toppings, (though why anyone would order come here and order a salad, I don’t know), I felt genuinely excited about what I was going to eat. The menu says ‘For 2 people sharing, we recommend 3 tapas as a starter or 6 as a main‘. So we ordered exactly that! Plus more! The food on both my visits was equally the same quality. But as I was asked to review the new menu I made sure on my second (sponsored) visit I chose all new stuff, and that’s what I’ll write about in this post. Just to save any confusion, I hope. The Beetballs were perfectly formed, and packed full of flavour. Made from beetroot, coriander and mint, in a rich tomato sauce I ate with a side portion of Zesty rice and wished the portion was bigger. Alex had the meat version, Albondigas, and swore they were the best meatballs she’d had in ages. Rainbow carrots glazed in brown sugar, lime and parsley, served with a butternut squash purée went fast. Whenever I see Patatas Bravas I always order them as I’ve eaten some amazing ones in Madrid and Mexico. Not quite the same feeling eating them in a restaurant in Friar Street in Reading, but still, the spicy tomato sauce and white bean purée was surprisingly moreish. Nachos were nachos! A generous amount of toppings but nothing out of the ordinary and always great for mopping up and eating all the last bits of tapas at the end. The Mojito Onion Rings were probably the biggest onion rings I’ve ever seen and for a side dish, the portion was huge! I’m not one to waste food, so was a little disappointed that these were the one dish we just couldn’t finish off. The Halloumi tacos were my least favourite. I found they had a weird aftertaste I couldn’t quite put my finger on. Arriving in a set of three they look very pretty and you can then wrap them up yourself or just fold and eat! Apparently, the Enchilada, stuffed fill of Cajun chicken, charred onions, mixed peppers and refried beans all rolled up in a soft flour tortilla was amazing! Smothered in Cuban cream sauce and chilli cheese, baked in the oven and topped with pico de gallo and sour cream and served with spiced black beans and zesty rice – Alex wasn’t complaining! She also enthusiastically declared that the prawns had just the right texture and flavour. I changed my mind at least three times but in the end went for the Chocolate, Coconut and Raspberry Slice as it sounded a little different from anything else. As much as I do love Churros, I really fancied some chocolate, and the raspberry sorbet sounded lovely. The portion was quite large and I did struggle to finish (are you surprised after all that food), but it was pretty superb. Now, this is where it all gets a little odd. The reason I decided to mention in this blog post that I’d been twice to Revolución de Cuba was that I had such different experiences on each visit, to the point we almost felt like we were in a totally different restaurant the second time. The first time we had a waiter who took the time to take us through each menu, advised us what he thought were the best dishes, suggested different combinations and was friendly, happy and took the time to chat. He was the perfect example of how service should be. The second visit, which was my official review visit, wasn’t horrendous but it certainly wasn’t great either. It’s also probably worth mentioning the staff didn’t know I was there to review the restaurant until right at the very end when the manager came out. The manager was dealing with an event upstairs so aside from showing us to our table he didn’t speak to our waitress. She was very stand-offish and completely the opposite to our waiter the previous week. We didn’t get asked once if we needed more drinks, I had to repeat my order four times and she even rolled her eyes at me when I couldn’t decide on what drink I wanted straight away. It wasn’t just us either as we also overheard and saw the same attitude with the table next to us. All a bit weird, but I think because we had such a different and positive experience the first time it wouldn’t put me off going again. Plus, the food was genuinely delicious. I’m tempted to organise the next Hello Cuppies Baking Group meet-up there next month, so fingers crossed we’ll not have a repeat…or get the same waitress! We had such a lovely time on both visits, despite the service on the second, and the food was far far better than I thought I was going to be for a chain restaurant like this. I’m also going to take the bad service as a one-off and just a bit of bad luck as the other waiters/waitresses around us seemed to be far friendlier. Price wise it’s pretty reasonable. Perfect for pre-night out drinks and food, family celebrations and if you like live music then you’ll love this place at the weekend. If anything, I need to go back just to taste the Pulled Jackfruit Burrito and the Black Bean and Butternut Squash Chilli. I imagine the food will be pretty consistent and reliable whatever day you go in the week, but I’d advise booking ahead if going on a weekend. It gets full fast. You can find exactly what’s on each month on the website here. I had a brilliant night on both visits, and I wandered off afterwards to get my lift home full to the brim with Tapas, tipsy on cocktails, and happy. *My visit to this restaurant was gifted in return for a. honest review post but as usual, all words, photos and opinions are my own. "(AD) Mollie’s Motel & Diner Review"
"Blogging, and What it Means to Me"